There is a certain, very specific kind of book that rarely makes it into the bookshops. It’s a sort of cross between a personal photo album and a corporate history. Large companies rather like to produce them to mark anniversaries. In a sense this is such a book, but it is certainly the most interesting one I’ve ever come across. It starts with an introduction by Bill Gates, which shows the importance of the technology spin-offs and business parks that have benefited so hugely from easy contact with the one of the world’s top science universities. Of itself it isn’t very readable – our Bill is no author, as his previous books have proved – but it does give the book a certain kudos. 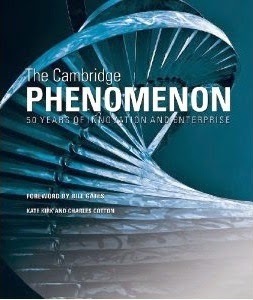 We then get into a history of the development of this outer circle of technoknowledge from the string and sealing wax Cambridge Consultants and Sinclair Radionics (nostalgic sigh from British geeks of a certain age) to the modern and hugely successful science parks. All this with glossy pages that have a generous dusting of quite interesting photographs in a near-coffee table 1.5 kilo wrist-buster. Although it is, without doubt, a superb example of its kind, it still isn’t a book that most of us will probably want to sit down and read through. There are just too many company names and people we’ve never heard of and just the mundanity of business. I’ll be honest, I couldn’t read it from cover to cover. But I did genuinely enjoy flicking through it, picking up on the interesting illustrations, dipping in when there were bits about Sinclair and other aspects that I’ve had direct contact with. While I couldn’t see myself rushing out and stumping up £50 for a copy (or about half that at online discounts), it is a book I would contemplate taking out of the library for a leisurely riffle.